Welcome, 2PCGers! That’s your new collective name! Today we take a first look at the Black Order Issue, the final Issue in the Infinity War Arc! 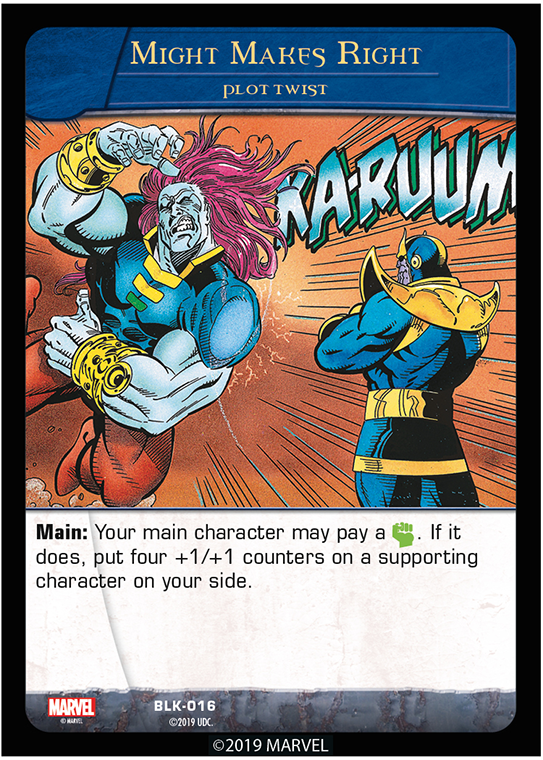 We’re gonna get an up-close look at some of the most ambitious cards, and characters, we’ve ever seen, and how they fit into the search for the Infinity Gems! Let’s start where that crazy purple dude got his own start, Titan! We first saw Eternals in an earlier preview for the Cosmic Avengers Issue in this Arc, but now you can make anyone Eternal! Eternal reads “If this character would leave play, you may put them into their owner’s hand instead.” Note that Eternal stilltrumps not just KOing, but also removing from the game, and any other way the character would leave play. Remember that these two cards are NOT super powers, and your main character must be face-up in order to pay for them. 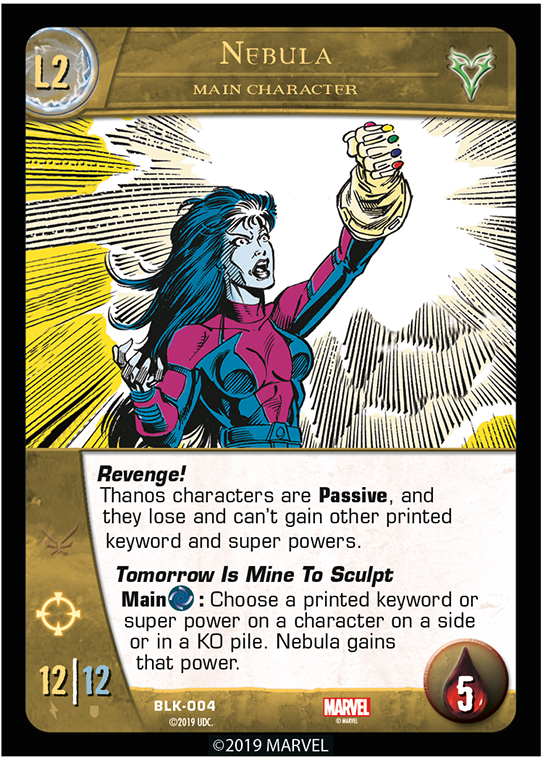 Continuing our “mighty” them, we have Thanos’s least-favorite-most-favorite daughter! 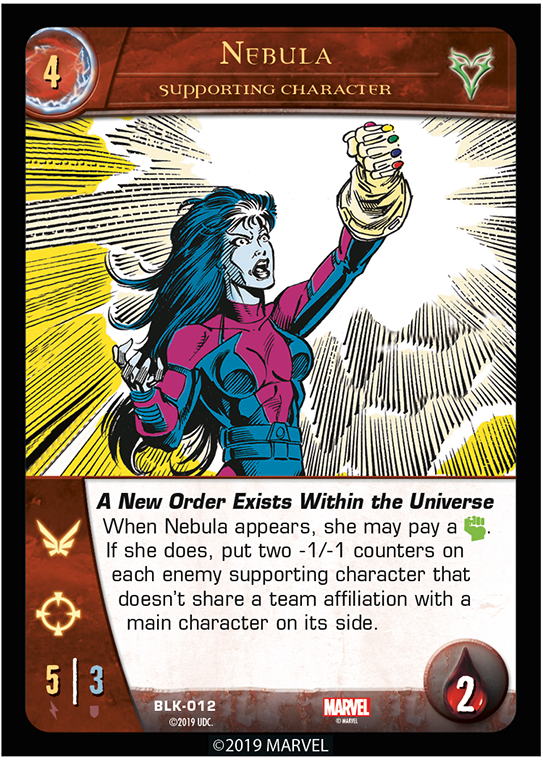 Nebula’s power is also not a super power, but it IS a super-duper type of powerful! But that’s not the only new Nebula! Here she as being horribly tortured by Thanos with unlife. powers other than Passive (and Thanos’s Greatest Creation, of course). This includes any granted by an equipment, too. 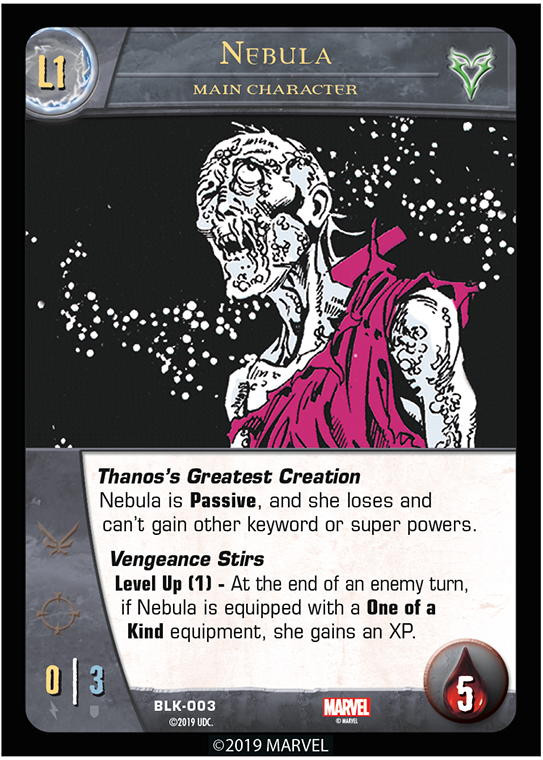 If you know the story, you know that a desperate, opportunistic Nebula seizes the Infinity Gauntlet when Thanos is otherwise disposed. Note that Revenge! works just like Thanos’s Greatest Creation, except for Thanos characters instead of Nebula herself, of course. We hope you enjoyed your first glimpse of the Black Order Issue in the Infinity War Arc! But where are those titular turkeys? Maybe we’ll see them soon! 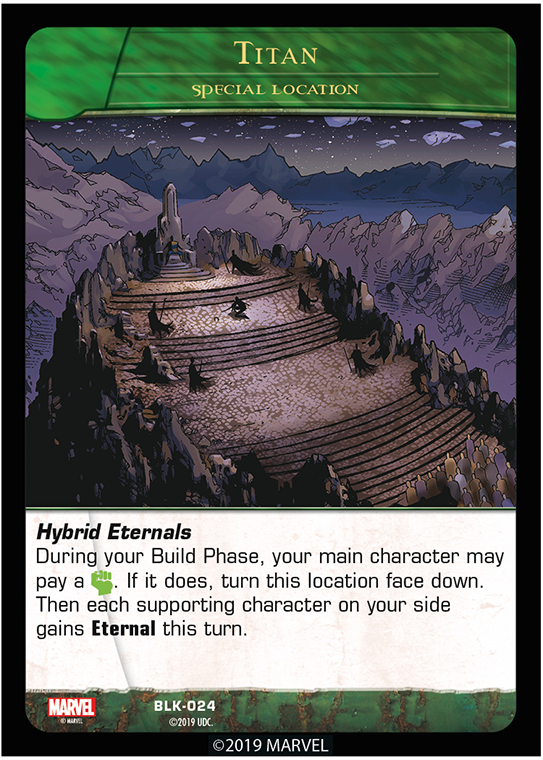 Thanks for checking out our second card preview for Vs. System 2PCG Black Order. Be sure to pre-order it with your FLGS. It will be available April 17th 2019!